Hi everyone, Jess here. Not going to talk too much, I’ll just get right to it. This recipe is pretty great with fresh and local cauliflower! The Food Network version is a good one, but it’s a bit daunting at first because it says it takes an hour and 20 minutes. The roasting of the cauliflower is done in 2 steps, however, and you can split those 2 steps into 2 shorter and easier stints. 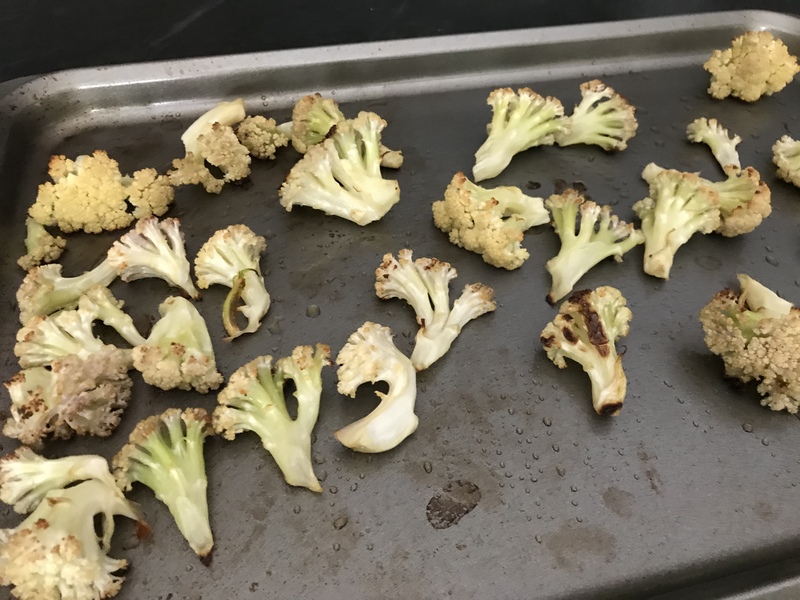 Once the cauliflower was well coated, I spread them on a rimmed baking sheet as instructed and roasted until crisp tender. (I went 25 minutes, but 20 really would have been ok). If you’re short on time and plan to eat these later on, this is a good time to take them off the cookie sheet and pop them in the fridge until you’re ready for phase 2 (then only 10-15 minutes till ready). and then toss your cauliflower in a bowl with said sauce until well-coated. Next, pop your cauliflower back on a rimmed baking sheet and roast about 5-7 minutes until the florets are done to your liking. I didn’t bother making the blue cheese sauce listed in the recipe as I was short on time, though I’m sure it would have been delicious. I instead used Brianna’s blue cheese dressing. Who needs celery and carrots when you have fresh lettuce, snap peas and cukes to cool things down? This dish is a good one, folks! Thanks to the Food Network for the inspiration, and thanks to you for checking this recipe out!